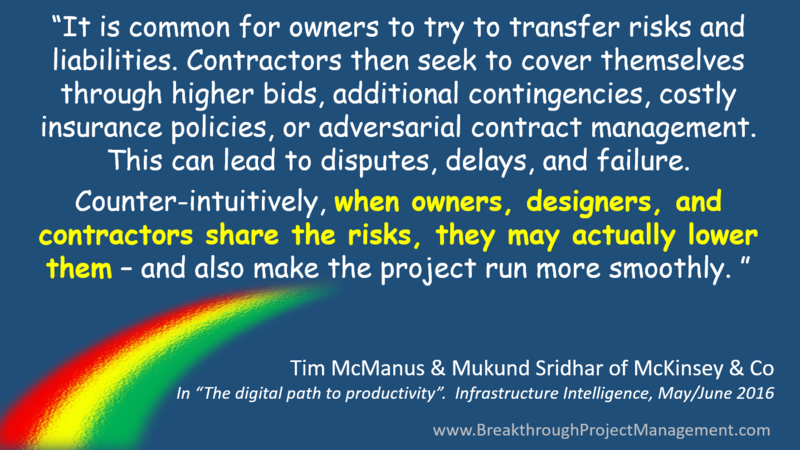 Global management consultancy McKinsey & Co underline one of the key elements of Breakthrough Project Management – sharing risk and uncertainty is key to minimising it. And we are not only talking about a reduction of risk. When uncertainty is shared, and managed as a project-wide issue, we reduce the project duration and cost too. This is key to delivering the benefits of BPM…. The quotation is from Infrastructure Intelligence magazine, May/June 2016, where you will find the article referred to on page 23.